Here is my threatened follow-up post on some of the issues that came up when I was idly looking up the history of Colonel E.H. Taylor for my review of his namesake Small Batch bourbon released by Buffalo Trace. Before I get into it, let me first say what this is not and what it is. It is not scholarship or even journalism: if I were doing either of those things I would spend months or weeks researching the subject. I would read every book on bourbon history to see to what extent and how this material has already been written about; I would investigate the archives of the distilleries and of the relevant locations (Frankfort, KY, for example); I would read historical studies of the Civil War and Reconstruction; I would interview experts like Chuck Cowdery, Mike Veach and Reid Mitenbuler. I have done none of these things because this is not scholarship or even journalism (and should not be confused with or held to the standards of those enterprises). What this is is a blog post: it’s exploratory, it’s speculative, it’s a clearing of space in my own head which might possibly lead to more detailed exploration down the road or it might not; hopefully it will invite responses from people who can fill in all the things I would know if I’d done the research and point me to other places to look; and, even if it’s all redundant, hopefully it will spur some discussion: there are subjects which even if already known benefit from regular discussion and I think this might be one of them. Here is another bourbon from Buffalo Trace’s E.H. Taylor line. In my review on Wednesday of the Small Batch release in the line, and in the comments posted later, I made some observations about aspects of the history of the man whose name is on this series, Col. E.H. Taylor. I’d thought that I’d expand on and clarify some of those thoughts a little more in the introduction to this review but I think I’m actually going to put that in a separate post later today or this weekend. So if you’re interested in that please come back then. 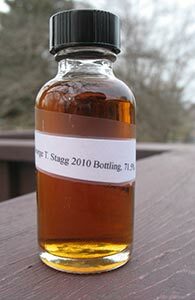 Here in a very timely manner is my review of the George T. Stagg from Buffalo Trace’s Antique Collection release for 2013. Along with the Eagle Rare 17 it is the straight ahead bourbon in that collection—I believe they’re made from the same mashbill; someone who understands these things better will surely be along shortly to explain what the differences between the two whiskies are (other than the Stagg’s always massive abv—though this 2013 release didn’t get as close to 70%, or above, as some others have). I’ve previously reviewed the 2010 and 2011 releases, both of which I liked very much indeed. I don’t believe I even bothered trying to locate any of the series in 2013. Anyway, complaining about how annoying the mania around the various American whiskey unicorns has gotten is now annoying as that mania itself. And I suppose if I really wanted to take a genuine stand against participating in this hype and all the folly attendant on it I would stop reviewing these bottles altogether. And so I will stop here and get straight to the review. I got this sample from Michael K. His review is here. 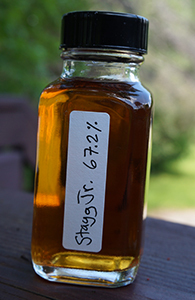 US law requires that the duration of maturation be put on the label for any straight bourbon aged for less than four years but it does not require that the bourbon’s name have any obvious relationship to this number. 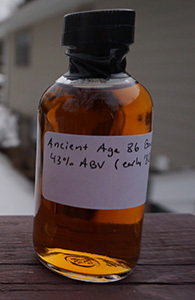 Thus a 3 yo straight bourbon from the Buffalo Trace stable is called Ancient Age—presumably it beat out “Wino’s Choice” in focus group testing (it’s close to $10 in most markets for a full bottle). This is not, however, that Ancient Age and if you think that I wrote the preceding sentences only so that I could make the “Wino’s Choice” joke, well, you are correct. Continuing with the theme of younger siblings of releases from the Buffalo Trace Antique Collection, here is the Sazerac Rye, a 6 yo*. 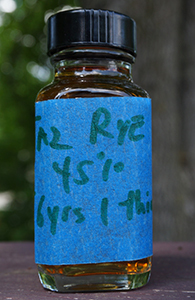 It just barely clears the requirements for being labeled a rye whiskey, being distilled from only a 51% rye mashbill. Though it bears the Sazerac name I believe this is supposed to be the same whiskey as is sold as Thomas H. Handy in the annual Buffalo Trace Antique Collection, only cut down to 45%. (If that’s not true please write in a correction below.) Unlike the Thomas H. Handy, however, it is both easy to find and very affordable (and easier to find and cheaper than the Stagg Jr. as well). 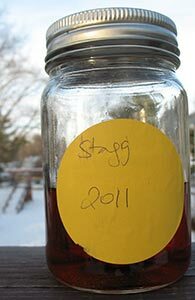 The Stagg Jr. from Buffalo Trace is probably mostly an attempt to cash in on the George T. Stagg name more than once a year. It’s received very mixed reviews from the bourbon cognoscenti and so you will all be relieved that one who knows so little about bourbon is able to make the final pronouncement. Here you go! 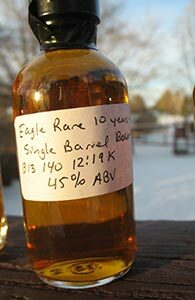 After yesterday’s Eagle Rare 17 from the 2010 BTAC here is the regular Eagle Rare 10. This is quite ubiquitous (most decently-stocked liquor stores have it), and very recognizable in its tall bottle. This is a single barrel release (not sure if this has always been the case); there’s surely some variation from barrel to barrel but I imagine they shoot for a pretty consistent profile in barrel selection. I’m embarrassed to say that I’ve never tried it before. Well, here goes. Every famous group has one member that doesn’t get as much respect as the others from the general populace and the Eagle Rare 17 is the Charlie Watts of the Buffalo Trace Antique Collection. 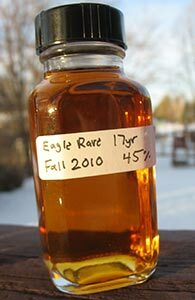 Of course, Charlie Watts was a great drummer and the Eagle Rare 17 is a pretty good bourbon too, despite being the one from the collection that’s most likely to hang around on shelves–at least that used to be the case; I’m not sure if it is anymore now that BTAC-mania has reached Pappy proportions. Anyway, this is from 2010– a more innocent time when there was no hatred in the world, every quarterback in the NFL was openly gay, and unicorns delivered free cases of the BTAC to every home in the land. As all bourbon comes from virgin oak it seems appropriate to post a review of a bourbon on Christmas. Also, I’m pretty sure George T. Stagg was one of the Magi. This is the Stagg from the 2011 Buffalo Trace Antique Collection which remains the only time I’ve got my hands on the whole set, and that without too much pain involved. I split the set with my friends Jessica and Nate. They got half and kept the bottles, and I got my half in mason jars. 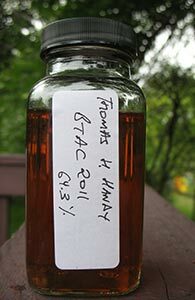 I remember Sku getting a big kick in LA this past summer on hearing that I had the BTAC in mason jars. Anyway, this has been getting air in the jar for more than two years now and has probably softened quite a bit as a result. So please bear that in mind as you read my notes. Nose: Somewhat closed at first (not surprising, given the strength). Opens up a little with time though: strong notes of cinnamon, pine resin, some mint and also some caramel and dusty wood. Increasingly sweet as well–brown sugar and also some sort of musky fruit. With water the pine/mint note gets pushed back and there’s some nice toffee and orangey notes. However, the wood also gets a little more astringent.